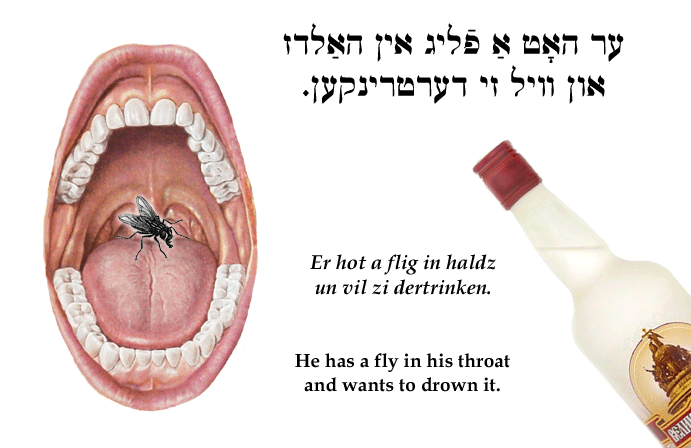 Yiddish Wit: He has a fly in his throat and wants to drown it. ‏ער האָט אַ פֿליג אין האַלדז און וויל זי דערטרינקען. Er hot a flig in haldz un vil zi dertrinken. He has a fly in his throat and wants to drown it. He has a tickle in his throat—used as an excuse to drink. SOURCE: Furman, Yidishe Shprikhverter un Rednsartn.